Maya does not want to move to Paris. (Poor girl.) But, her mother has just made a spectacular recovery (mostly) from her battle with cancer, and she wants to live in Paris, so they go. After all, who is going to say no to the sick mom? But when Maya and her family — mom, dad, little brother James — get to Paris, weird things start happening. First off, their cousin — well, she’s more like a great-aunt — Louise is mostly, well, not there. Invisible. And kids disappear from their neighborhood. Their cousin-uncle Henri is quite friendly, though is house is weird, and he’s got those creepy purple eyes. Not to mention the Dauphin at school and his unusually (read: creepy) young parents. And then there’s the Cabinet of Earths. It holds the sands of time… literally. For whomever has their sands in the bottle, they will be immortal. And Maya has been chosen as the next Keeper. It sounds ominous, and it is. But, a good kind of ominous. Creepy-cool ominous. Which is one of the things I really liked about this one. There’s this aura of danger throughout, and Maya is dealing with things that no one else can see. Thankfully, she has Valko (whom I liked, even though I thought he was almost completely unnecessary, but a girl needs a sidekick, right?) who believes that what she’s seeing is Real. That, and Cousin Louise, who is really quite awesome. 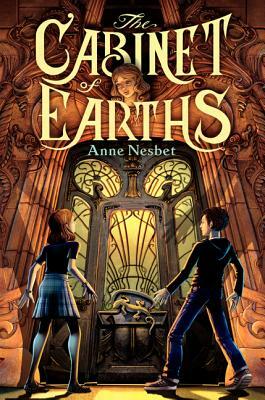 The other really cool thing about this one (aside from Paris, which gets bonus points for just being there), is that Nesbet mixes science in with the magic and the supernatural. I’ve heard it said that magic is only things that science hasn’t proved yet, and Nesbet takes that literally. Not only is Maya’s dad scientist, Nesbit mixes in the beginning of chemistry with the magical history, weaving the science and magic together. I haven’t seen that before (maybe I ought to get out more?) and I thought it worked quite well. I also liked that even thought there’s room for a sequel at the end, the book basically stands alone. And in this Cybils season, where I’m reading second, third, and fifth books in a series out of order, I thoroughly appreciate a stand-alone as a breath of fresh air. In short: an excellent debut. I’ll be looking forward to seeing what Nesbit offers up next. I read this book earlier in the year and really enjoyed it. It has the appeal of classic and contemporary middle-grader books but comes at the reader with so much that is fresh and fun. Definitely a lot of fun. This sounds good. I will have to check it out!